Salty-Licious: Our 71% chocolate with Caribbean Sea Salt! Sweet, salty and chocolaty. 100% Chocolate: Pure cocoa flavour, savory and delicious, light acidic fruity notes, perfect for any chocolate recipe requiring unsweetened chocolate or to eat as a strong savory snack! 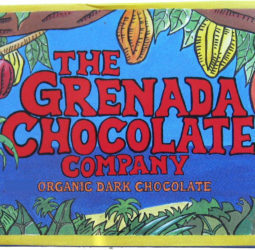 Our 82% bar won the 2011 Silver Medal fromThe London Academy of Chocolate Awards! Our 71% bar won the Silver Medal from The London Academy of Chocolate Awards in 2008. Organic Chocolate bars (3 oz/85 gr) Ingredients: Organic cocoa beans, Organic raw cane sugar, fresh Organic cocoa butter (no added cocoa butter in our 82% and 100%), Organic soy lecithin (an emulsifier). Pure and delicious, perfect for hot-chocolate, chocolate ice-cream, baking, etc. 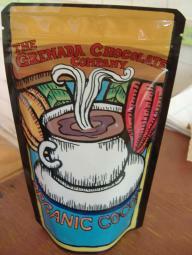 Grenada’s cocoa is known for its extra rich flavour and strength. Our Organic* Cocoa Powder is uniquely rich and flavourful because of our small-scale relatively low-pressure cocoa butter press and, of course, because of the special taste of our cocoa beans! All our bars are suitable for ovo-lacto vegetarians Suitable for vegans, Kosher certified, Halal certified & Free from latex.